Club Penguin Cheats by Mimo777 Club Penguin Cheats by Mimo777: Rockhoppers Plants are Growing in your Club Penguin Loo! Rockhoppers Plants are Growing in your Club Penguin Loo! Yeah, first, this is Me Santa's Loo (igloo). And it is quite a mess, kinda like his side of our room. He has Legos and Hot Wheels everywhere! Anyways, Remember during the Adventure Party and Rockhopper brought the Plants? Well they are growing pretty good now. The trees even have little flower blooms on them! I know many of you has seen this but some haven't. I still think these plants might be a part of a new mission. Maybe not but then again, maybe! Hey mimo try Adventure Quest Worlds! Aww u didnt say anything to me not even hi ;-( Allwell...even tho i woke up at 2am lol. Nah ur cool. I just saw u in the pizza parlor! U were changing outfits pretty fast! so cool 2 finally see you, but you didnt acept my friend request or give me a postcard:( oh well. I saw happywagon too! Go mimo! And I think I know what you're getting ready for! See you guys at the Aqua party! I like Me Santa's iggy! The whole wall-covered-in-torches thing is so cool! Hey Mimo I was at your Aqua Party today..... IT ROCKED!!! It was my first time seeing you in person or should i say penguin! lol! It was the best time i eva had! I saw that a while ago but the tree didnt have fruit on it! Totally awesomeness! Oh and I sent you an email Mimo! Yea i like it to. I Didnt make it to the party! Wahhhhhhh! Whens that party of ours?!? LOL that sounds exactly like my bedroom cause i got a loft bed and everything is all mixed up! i was trying to get one of my stuffies (plushies) and i couldnt find it then like week later i came across it under my pillow! i know right?! Yeah, we /all/ know what that was. If you love club penguin parties keep checking my blog to find out when my first ever one is! As it is the first there will be NO CLUES! 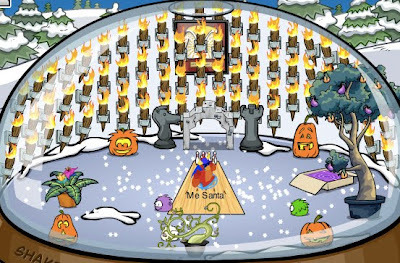 Wait a sec.... you call igloos 'Loo's? You do know that means TOILET right? Me Santa likes LEGO so do I!